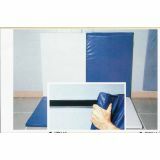 4' x 6' non-folding mat serves as wall padding or as a tumbling mat. 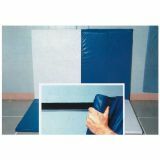 Vinyl covered 2" thick foam pad features 4 carrying handles and 1-1/2" W hook-and-loop closures on all four sides. Please specify color when ordering. For use with our GMVH-1 wall mat. The 2" wide aluminum strip is easily mounted to any gymnasium wall. Pressure-sensitive 1-1/2"W hook-and-loop closure securely bonds to the aluminum strip for long-lasting use. Sold in 4' sections only.